Can I be honest for a second? It is hard, hard, HARD to be a stay-at-home momma with a side hustle. I have a shirt that says "surviving not thriving" (thanks Clea and Joanna) and it seems appropriate to wear it every day (except that I accidentally ordered it too small and it makes me look absolutely tragic - the ultimate surviving not thriving)! Regardless, that is the mantra running through my head most days as I divide my attention between the tasks at hand while daydreaming about my goals for the future of my business and trying not to forget to pick up a kid, or that I was supposed to bring dinner to someone or something. Anyway, all of that to say, I took these pictures six months ago and have been meaning to share them ever since. 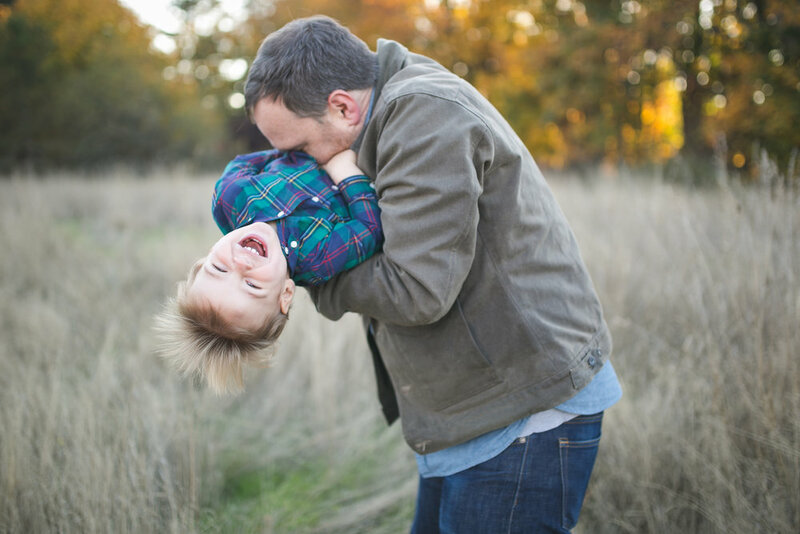 This family radiates love and joy, and they made it easy to capture their essence. 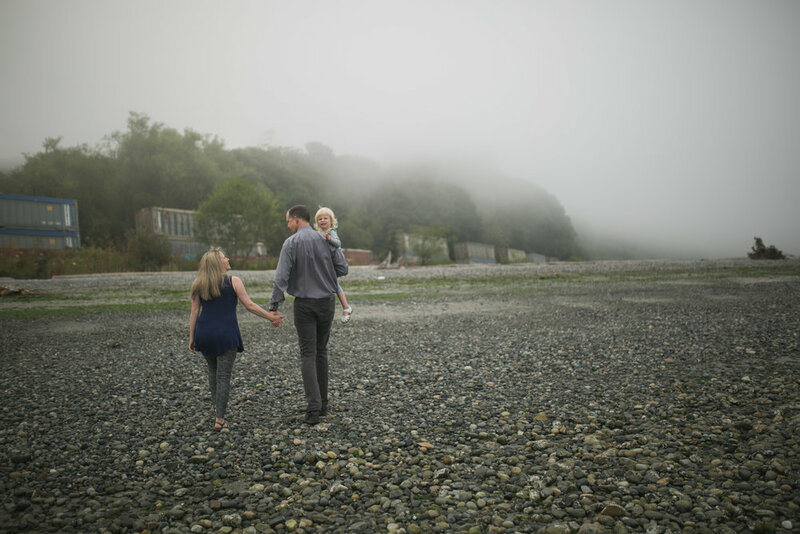 If you think these pictures are beautiful, that should give you an idea of who Dustin and Julianna (and their kids!) are, one of the kindest and most loving families around. I am lucky to call them friends. Right now, in the middle of winter, it is dark and gloomy. The rain is falling and pouring down the street in little rivers making this late summer day feel like a distant memory. There was ash falling from the sky and our mid-morning shoot had a hazy red tint due to the smoke in the air, but these two smiley six-month-olds didn't mind a bit. I have had the pleasure of working with several sets of twins and I am always impressed with the level of teamwork their parents display. 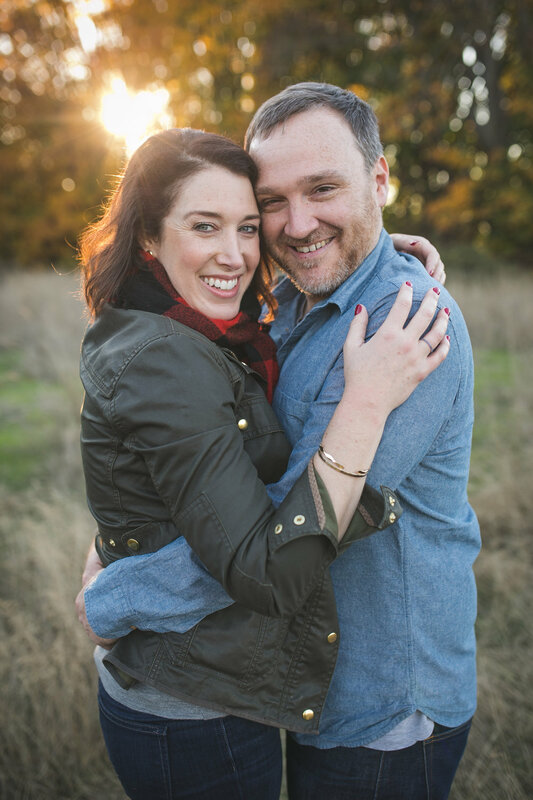 Their arms are full of babies and stuff; juggling bottles, strollers, diaper bags, dog leashes, and extra outfits, but their words to each other are kind and encouraging and they are spoken with humble hearts and smiling faces. What lucky babies to grow up in the strong arms of these kind parents. I have been taking pictures of the Davis family since little Etta was six months old. She has always been a beautiful, happy girl, and it is a shoot I look forward to every year. 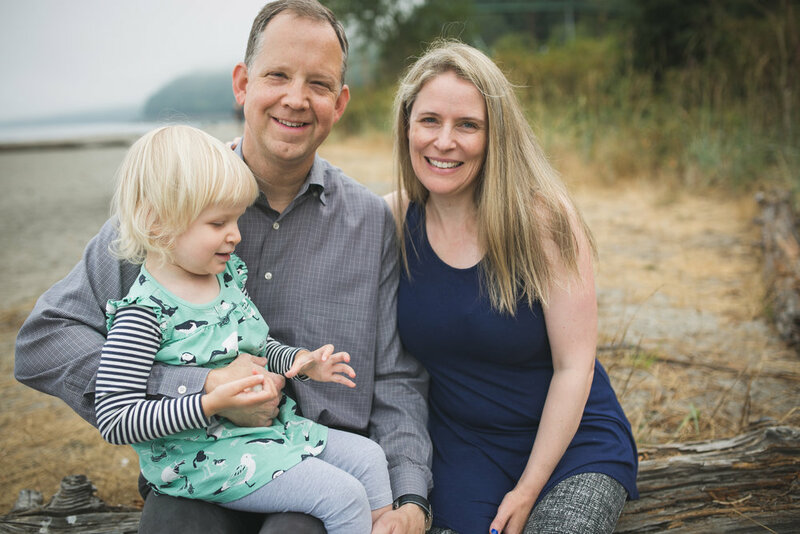 Her family just moved to a new (to them) neighborhood in Seattle so we decided to do the shoot at their home, on their block, and at the beach park they visit nearly every day. Last year, Etta was a little timid during their photo shoot. This year, she greeted me at the door with a smile, showed me her new room, and cried when the shoot was over. What a difference a year makes! 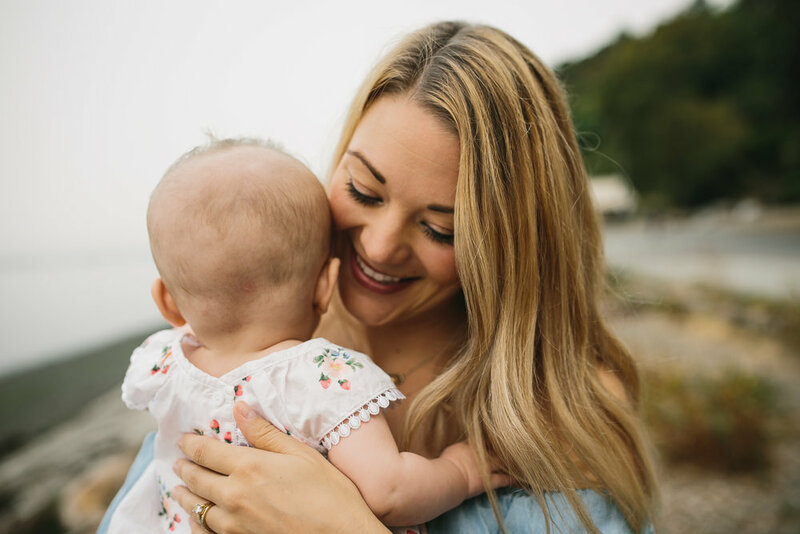 We got a lot of beautiful pictures during our shoot, but my favorite is the one of Etta wrapped up in her mom's arms. 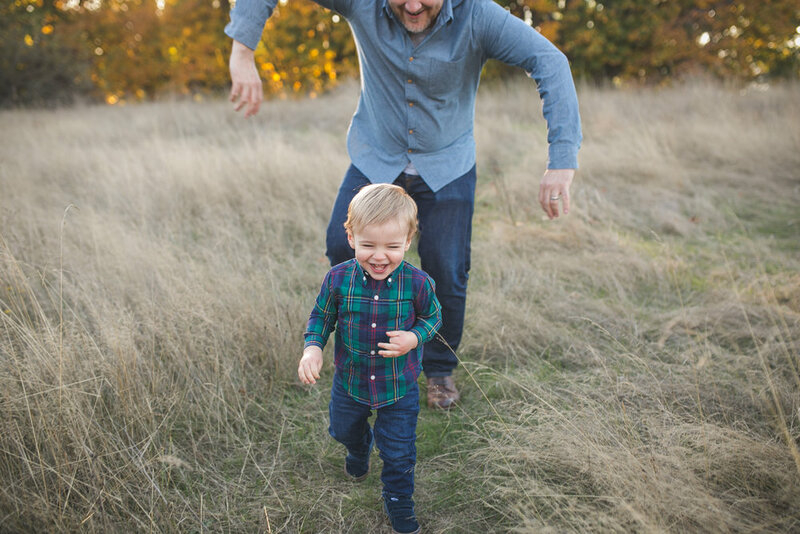 Etta's dad had been chasing her and she ran giggling and screaming straight to her mom's open arms. Arms that closed around to protect and embrace. Arms that feel like home to Etta. Etta's mom closed her eyes and smiled for just a moment. Enjoying the weight of her daughter against her chest. The feeling of home in her arms. It happens every year. Fall comes, business ramps up, and I am completely overwhelmed by weekend photo shoots and late night editing marathons. Actually, shooting and editing are not really overwhelming, it's trying to get through my busy season in addition to being a stay-at-home-mom to three beautiful and crazy little girls that really sends me over the edge. My girls are now almost six, four, and eighteen months. Norah went to kindergarten this fall, Vivienne started at a new preschool, and Emory started running around town like she owns the place. They would drive me nuts all week long when I would try to squeeze in a few minutes of editing in between shuttling one to school, putting one down for a nap, making one a snack, and answering a million "why" questions from the three of them. And then I would miss them like crazy all weekend and I would constantly harass my husband (Superdad) to send me photos of everything they were doing while I was away shooting. I feel like it's a constant struggle to achieve a healthy work/life balance (does that even exist?!) and it feels impossible to work through my busy season while also loving my family well. I let the dishes sit in the sink and the laundry pile up, I ordered takeout too often and let the kids watch too many episodes of Wild Kratts, and sometimes I let them go to bed without saying goodnight because I didn't want to stop working long enough to climb two flights of stairs to deliver their hugs and kisses. But. We made it through. And I even remembered to block my calendar in the midst of the chaos for Vivienne's birthday so I could throw her a party. A unicorn volcano birthday party complete with a paper mache volcano science experiment and homemade exploding volcano cake. Does this earn me an upgrade to Best Mom Ever? So. 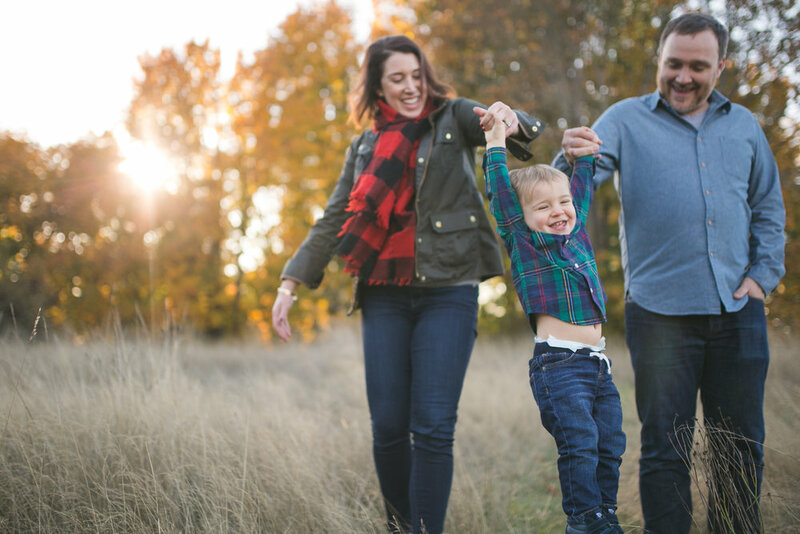 The last three months have been a blur, but things are slowing down and now I am looking forward to going back through the shoots I did this fall and sharing some of my favorites. 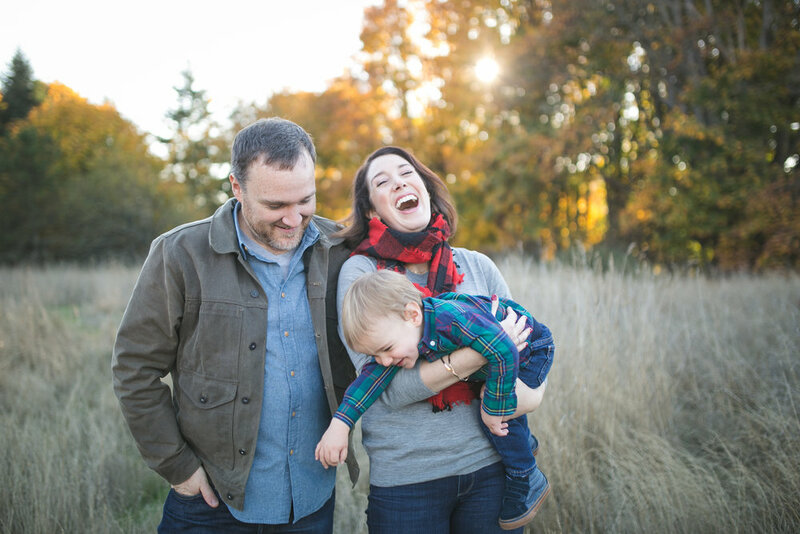 I'll start with this family - in the perfect late afternoon fall light, laughing and playing through the entire shoot. These beautiful moments and pictures are the reason why I do what I do. All of the crazy is worth it to me to deliver images and memories like these. The weather has turned, the leaves are changing, and it's officially fall! 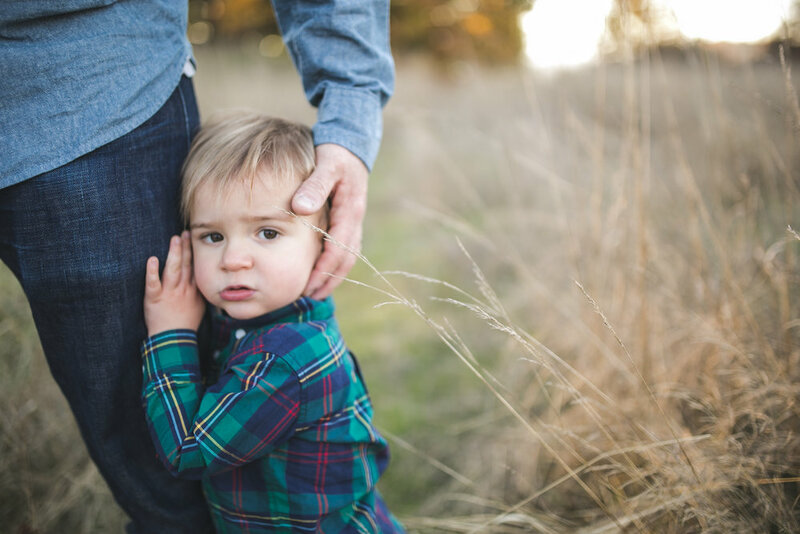 The season for family photos is in full swing, and I thought it would be helpful to share a few tips on how to prepare kids for your family photo shoot. Hopefully these suggestions will help everyone show up on shoot day excited, ready to participate and have a great time! A few days or week before your photo shoot, walk them through what is going to happen on the day and during the shoot. 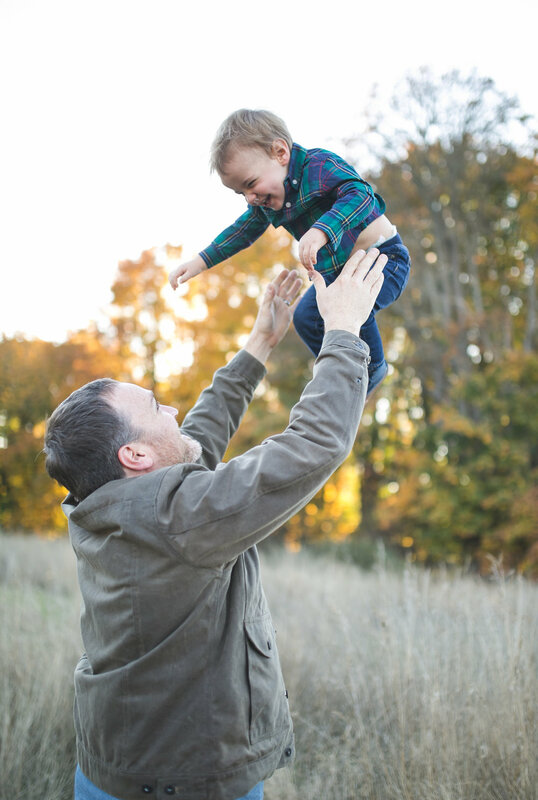 Tell them why these family photos are important to you and what kind of pictures you are hoping to get with them. Show them old family photos and ask them what they think about the pictures they see. Tell them what you're going to use the pictures for, and how their behavior or attitude will affect the photos. Repeat this every day until the shoot so they really understand what is expected of them and why! My daughter Vivienne (4) will not walk out of the house unless she feels beau-tee-ful in her clothes. If I make her wear something she is not into, she will walk around with a pout on her face and her head down for hours. 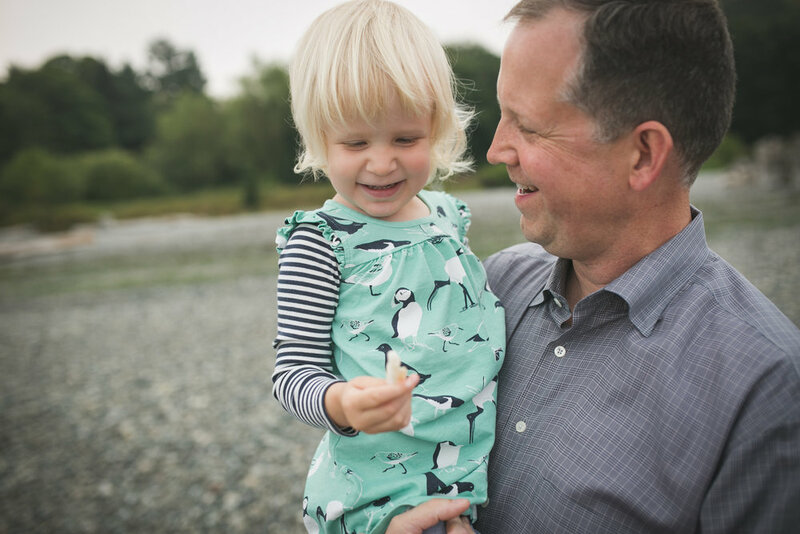 So...if you have a strong-willed toddler like me, involve them in choosing their outfit. Or let them add a special accessory to an outfit you have chosen for them. If they love what they're wearing, this will translate into excitement for the shoot and smiling faces in the photos! 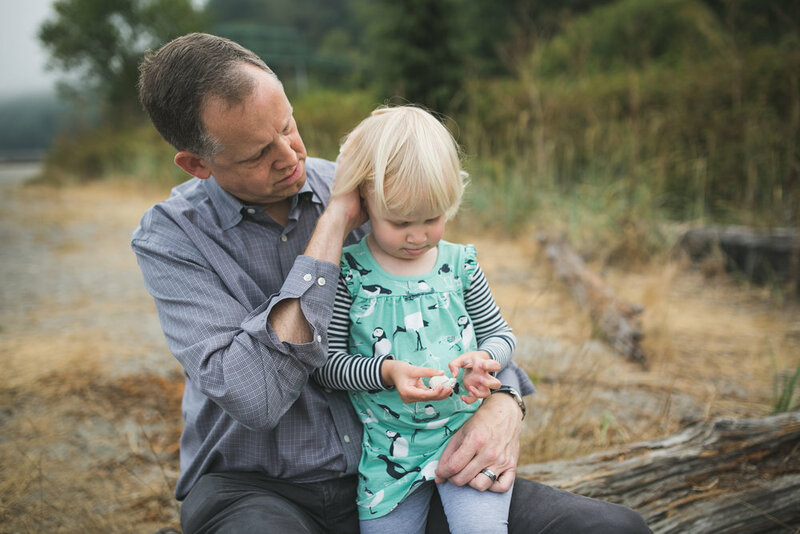 If your kids aren't into sitting or following directions for more than a few minutes, choose a location that will allow for activities, or bring a few things to use in the shoot. Beaches are perfect for squirmy toddlers because there are a million things to do there. 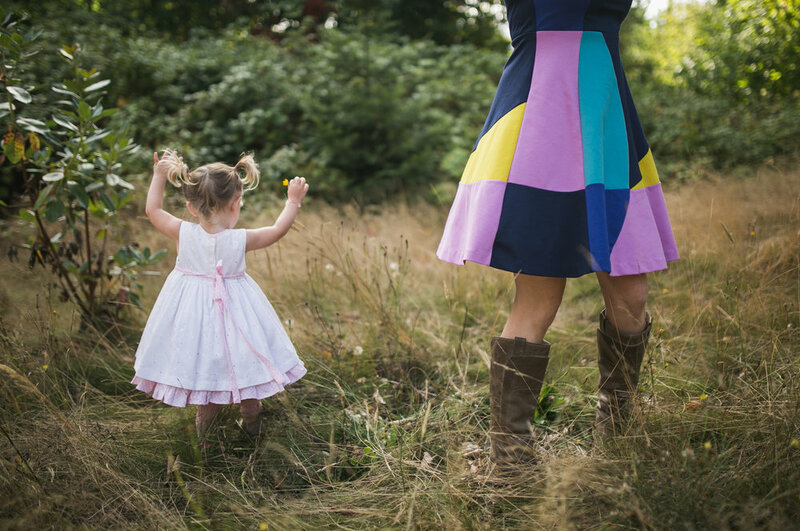 If your shoot is in a grassy field, bring your child's favorite book or activity. If you can't think of anything to bring, bubbles are always a hit! Extend the special family day together after the shoot by going out for a treat, or doing something special. Sounds a lot like a bribe, but frame it in a way that encourages cooperation. "Let's listen to the photographer and finish up our photo shoot so we can get on with our day and go out for ice cream together!" Because who isn't motivated by ice cream? !